This Garlic and Herb Poached Salmon is a healthy dinner that comes together in a matter of minutes. You will never believe how easy it is to prepare the perfect piece of fish! Oh my goodness, you guys! This poached salmon was such a beautiful surprise! I mean, I was raised on poached salmon (thanks, Mom! ), but I haven’t prepared it in my own kitchen in yearssssss. It was just absent from my radar screen, completely overshadowed by grilled marinated salmon in the summer and my favorite 4-Ingredient Baked Salmon in the winter. But no more! Poached salmon deserves its own moment in the spotlight…especially when it’s full of garlic and herb flavor. If you’ve never poached salmon, it’s really simple. You just cook the fish in a pan of liquid (white wine and water, in this case), which is infused with tons of fresh ingredients. 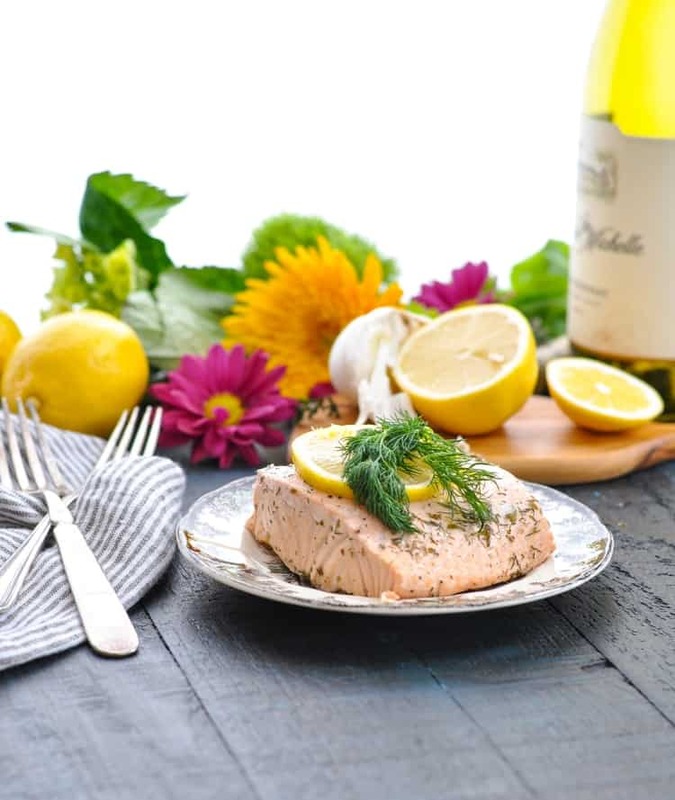 The salmon absorbs the garlic, herbs, lemon, wine, and onion flavors as it gently cooks, resulting in a delicate, tender, moist, and delicious seafood supper. The poached salmon tastes fancy enough for entertaining, but it’s also quick enough for a crazy weeknight! 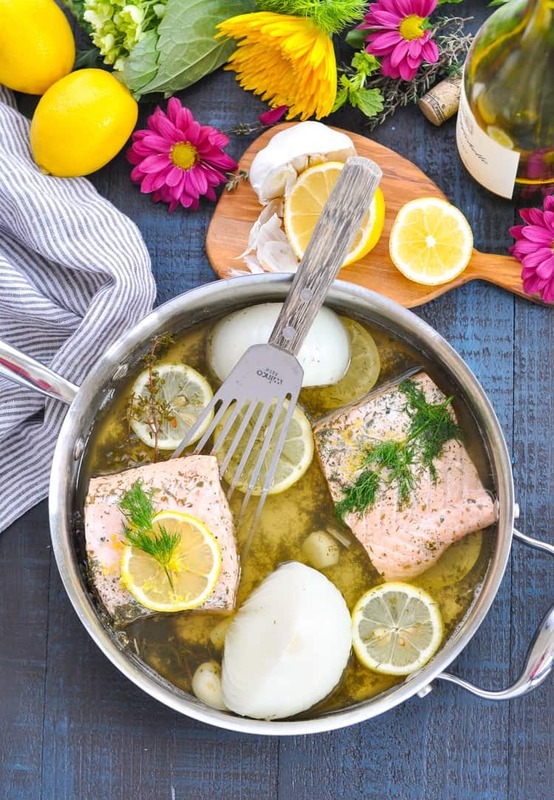 When you don’t want to bother with turning on the grill, and instead you need a quick dinner that cooks in one pan on the stovetop, this Garlic and Herb Poached Salmon is the perfect healthy solution. It’s high in protein, low in carbs and sugar, and it’s a tasty way to incorporate seafood in your diet without much effort. What more can we ask for?! As the season of Lent is upon us, I hope that you’ll plan an evening to enjoy this simple, nutritious, and satisfying supper. 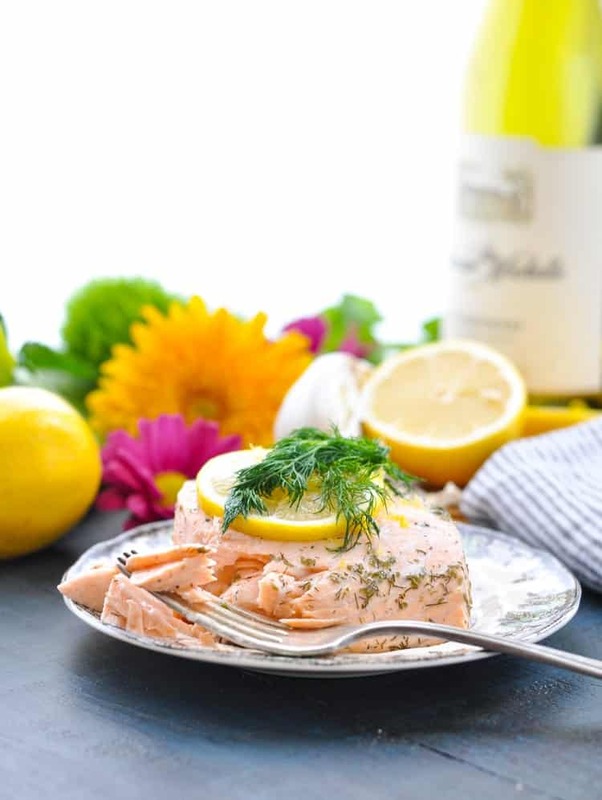 It’s time to rediscover poached salmon, and this is the perfect recipe to really let it shine! In a medium skillet or saucepan, combine wine, water, lemon slices, onion, dill, parsley, thyme, garlic and salt. Bring to a boil. Reduce liquid to a simmer over low heat, add the salmon, and cover. Cook for 5-8 minutes, just until salmon is done. 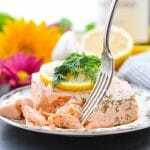 Remove salmon to serving plates. Garnish with fresh lemon zest and chopped herbs, if desired. Cooking Just for Two? This recipe yields 3-4 small servings or 2 larger servings. If you want to cut the amount of salmon in half, you can still prepare the same amount of liquid for cooking. Cooking instructions remain the same. Tip: Mix up the herbs! If you don't care for dill (or any of the other herbs that I used here), you can swap them out for your favorites. Recipe adapted from The Martha Stewart Cookbook. I’ve never heard of poached salmon before! What a great way to cook it. This looks so full of flavor and I’ve got to try this since we eat salmon all the time! Love the fresh herbs in here, too!